If you are like me, you have solicited multiple bids for a home improvement project where cost has often started out as the leading driver for selecting a contractor. However, as the project progresses you quickly realize there is more to a project than simply the price. As construction delays pile up, phone calls go unreturned and your frustration grows, buyer’s remorse may set in. While cost is important, there are other required attributes such as reliability, responsiveness, quality, creative solutioning, and meeting agreed upon deadlines when selecting the right partner. The same is true in selecting a custody and fund accounting business partner. Fund fee pressures routinely capture the headlines as managers appear to be in a race to zero (or beyond!) on fees. To aid in this cost saving journey, custody and record-keeping services are often identified as an opportunity for savings. In turn, service providers have attempted to do their part through various operating model changes and technology enhancements including offshoring, creating ‘centers of excellence’, and ventures into disruptive technology solutions. 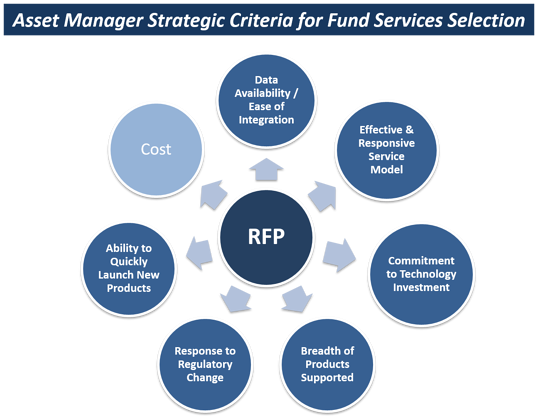 Yet as product complexity and regulatory requirements continue to mount, asset managers' needs are changing and they are looking to service providers to offer more than core services. Establish strategic criteria that is broadly agreed upon as the primary value drivers that your firm is seeking from a service partner. Determine the relative importance of each criteria by establishing a weighting methodology that reflects the importance your firm places on the key value drivers. Have a clear organizational view on benefits and challenges associated with service provider consolidation vs. diversification. Leverage the process and review of provider capabilities to evaluate opportunities to optimize your own operating model. Engage SMEs across the broader organization to gain multiple perspectives, insight, and support throughout the evaluation process. Evaluating and selecting the right business partner is not an endeavor most do on a daily basis, although it is more critical than ever. Whether choosing a contractor for your home improvement project or a service provider to partner with your asset management firm, cost will always be a large factor. But in today’s highly complex and competitive landscape, asset managers are looking beyond “just” price. The importance of selecting a business partner that aligns with all of your strategic criteria is invaluable in realizing your long-term service goals.